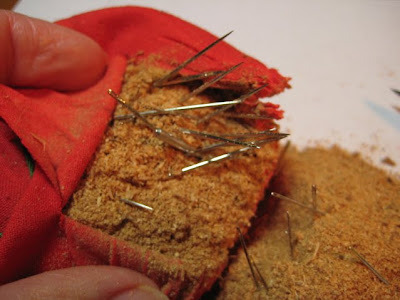 You know how you just KNOW that you had stuck that needle in the pincushion, but now it's nowhere to be seen? Well, that had happened to me just a few too many times and I got curious. 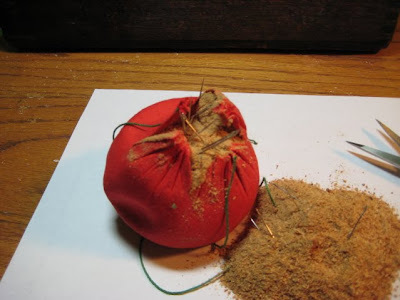 My old tomato pincushion was on its last leg so I got a new one and decided to do a little surgery. I cut into the cushion and started to dump the filling out when much to my surprise, I saw lots of shiny glinting. Now, this is almost scary in its ridiculousness! It looks like a medieval weapon! 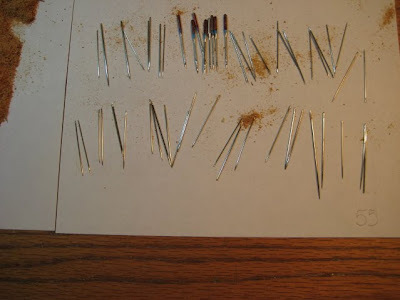 55 needles! Yes, I said 55! OMG that is the funniest thing I've seen today! Thank you for the laugh.